I haven’t used the crock pot in a long time. I do enjoy the convenience of it, especially when it comes to cooking a whole chicken and not worrying if it’s going to become dry. Now, I am a fan of roast chicken; but this recipe is great because there is no added fat to ensure moist chicken. Verdict: This is pretty good, but I will do things a little different next time. First, I’ll start the crock pot earlier in the day to cook it on low, (because of the late start I cooked it on high for 5 hours), be sure to place the bird breast-side down and skip the foil. 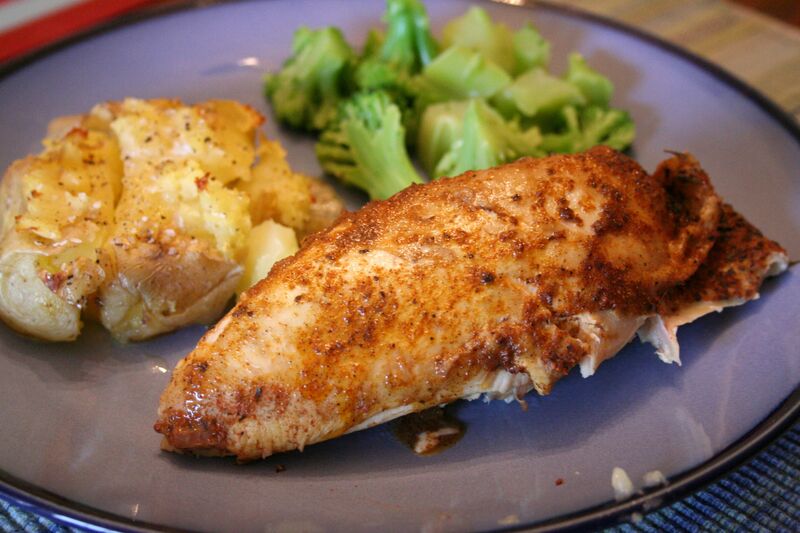 We ate this with PW’s crash potatoes and some steamed broccoli. I will post the recipe for the potatoes tomorrow – they’re really easy and complimented this dinner nicely. Thanks for reading, enjoy! 1. In a bowl, combine all of dried spices. 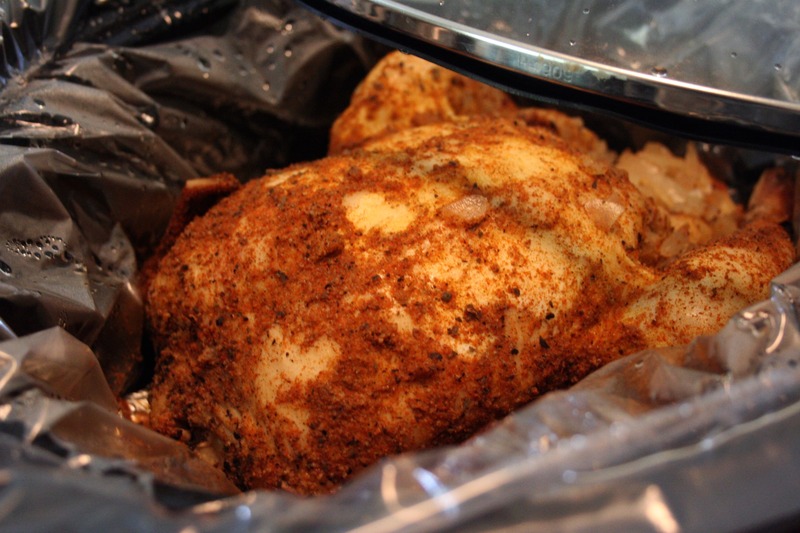 Rub the spice mixture all over the bird, inside and out. Plop the bird breast-side down into the crock pot. If desired, shove 4 whole garlic cloves and a quartered onion inside the bird. Do not add water. 2. Cover and cook on high for 4-5 hours, or on low for 8. The meat is done when it is fully cooked and has reached desired tenderness. The longer you cook it, the more tender the meat. Looks great, Shawna! I’ll try it. I really love the crockpot and use it about once a week — so convenient!